Heh, I wish… Not that terrible for a photoshop though. You wish? Just buy a bloody 1911 lol. I had a springfield loaded. I don’t baby my guns at all, so it had bad surface rust, and then that turned to pitting after only a year and a bit… I wasn’t impressed so I cleaned it up and sold it. At least glock would make a 1911 that I wouldn’t have to worry about cleaning and storing in a humidity controlled environment, and it would look the same for years and years. Pro tip: Dont let metal guns rust and there wont be pitting. The slide on the glock is metal, I’ve never had problems with them rusting. Well it was a Springfield. There’s yah problem lol. Get a proper RIA 1911, and take care of it. Besides, A Glock 1911 pattern pistol would ultimately end up in the hands of their greatest customers, Gang bangers, rappers, guys who be thuggin, criminals in general, who insist on high capacity ‘clips’ and other nonsense… And crap like that would tarnish it’s image. Forever. Do not want. I’d buy it because it’s a cool idea. I’d leave it at home because i baby my 1911 and carry that instead. Buuut heyyy different strokes for different folks. don’t hate on Springfield… i own several and they are very nice! to endo mike: YOU ARE WHY WE CANT HAVE NICE THINGS! 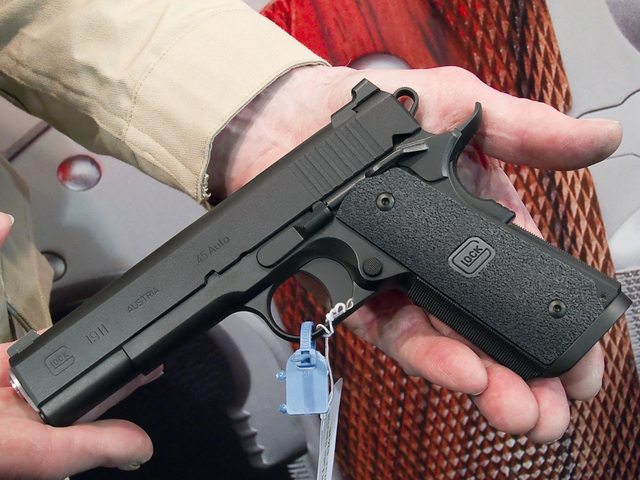 Or buy a 1911 treated finished similar to the Glock – there are plenty of options out there. Would you complain that the blueing came off your Colt Python because you carried it Mexican in your crack all day too? Reminds me of Counter-Strike: Source a little bit, where the modding community made 1911 skins for some guns, called the HK 1911, which was a 1911 with the blocky slide of a USP, with HK trademarks. Don’t ask why, I don’t know why. The thing I don’t get is where it came from. Dozens of versions of that model exist throughout the Counter-Strike: Source modelling world, but I haven’t found an explanation why instead of standard 1911s, or Kimbers, a fake HK 1911 was chosen. What do you mean “Fake 1911”? Also, anyone know where I can pick up this model? I want to use it in Gmod. I said fake HK 1911. So far as I know, Heckler and Koch hasn’t produced a 1911 model, making the one from CS:S a fake. Also, check FPSBanana. Ah, I read your thing wrong. I thought you said they used a fake-1911 base instead of a kimber or something when creating it. I was confused. I would buy one of these in every available caliber and I don’t care who knows it. Say it loud i like glock and i’m proud? lol. You can tell it’s fake because Gaston would have put on the worlds largest arched mainspring housing. The standard housing is WAY too ergonomic and comfortable. It’s a pretty darn good photoshop job, especially after seeing the original picture. Is not a Glock “God premiums”? You brought up blasphemy earlier. I’m no religious expert, but wouldn’t it be blasphemous to suggest that a commercial item is somehow Godly? I love this comment. +1 sir. Also, “Mein Gott” means “My God”. Usually used as an exclamation. All of the range and recoil with none of the power. Take the venom out of a cobra whydontcha lol. If ever produced, (pray to the Glock gods) I would procure one of these as quickly as possible. This is about the only time where a Glock looked aesthetically amazing. Greatest thing in the world for making 1911 fanbois strip their gears. Also, not outside the realm of possiblity: Wilson used to make (maybe still does) a polymer-framed double column 1911, so it can be done.